Calling all SEGD Atlanta members... Here's your chance to volunteer and give back, while networking with likeminded design professionals from IIDA! In the design and construction industry, we find ourselves creating a lot of waste from expired or unused materials collected in our finish libraries that inevitably make their way to the landfill. So we asked why not repurpose, or upcycle, these materials back into our community? Once unwanted materials can have a new life as free-source materials for educators and non-profit associations, or be transformed into works of art by artists and crafters. ZeroLandfill is a program of BeeDance. For a fifth year, IIDA Georgia (International Interior Design Association of Georgia) has partnered with Wilsonart to bring the ZeroLandfill event to Atlanta. To date, we have helped upcycle more than 156,000 pounds of discontinued architectural and interior design samples. Help us beat our previous year totals by participating in the 2017 ZeroLandfill Atlanta event! Donating Materials? Register under "Material Drop Off" and bring your discontinued or unwanted material samples to make our event a success! Drop off the materials at our new event venue Certified Finishes on one of our drop off days, Friday, August 4th and Friday, August 11th from 3:00 PM to 6:00 PM. Carpet tiles/samples, ceramic tile, stone samples, fabric (memo size or larger) , paint chips or fan decks, laminate chips, resilient flooring, solid surface, ceiling materials, wallcovering, decorative resin products, glass, wood and metal samples.Please no binders, sample tip cards, magazines or office supplies.Please sort your materials by category for drop-off and utilize the standard labels to assist us in the weight documentation process. Contact [email protected] to request a PDF of labels for your use. If you have a large truck drop off, please give us advance notice at [email protected]. Volunteering? We need lots of volunteers to help us both Fridays, August 4th and 11th and Saturdays, August 5th and 12th. Register under "Volunteer" and we will send additional information to you via e-mail. 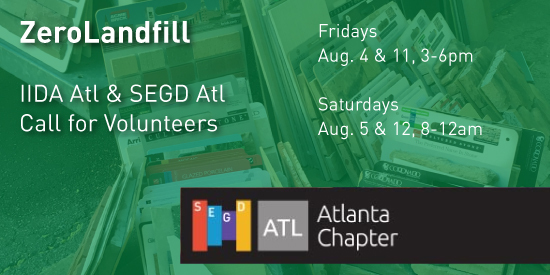 For Saturday volunteer signup, please visit this Eventbrite link: Please sign up via our Saturday EventBrite at this link: zlfatl2017saturdays.eventbrite.com For those in the design industry, each volunteer hour can be self-reported as one USGBC CE hour to help you maintain your LEED GA or AP credential. Questions? Visit our Facebook event page for current updates. Any questions, contact us at [email protected].